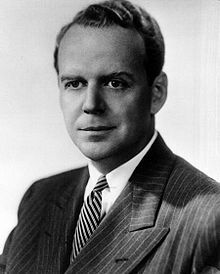 Clark McAdams Clifford (December 25, 1906 – October 10, 1998) was an American lawyer who served as an important political adviser to Democratic presidents Harry S. Truman, John F. Kennedy, Lyndon B. Johnson, and Jimmy Carter. His official government positions were White House Counsel (1946–1950), Chairman of the President's Intelligence Advisory Board (1963–1968), and Secretary of Defense (1968–1969); Clifford was also influential in his role as an unofficial, informal presidential adviser in various issues. A successful Washington lawyer, he was known for his elite clientele, charming manners, and impeccable suits. All four Democratic presidents of the Cold War era employed Clifford's services and relied on his counsel, marking him as one of the ultimate Washington insiders. Emblematic of Clifford's influence in postwar Democratic presidential administrations was the fact that after Jimmy Carter won the 1976 presidential election, his transition team was adamant that Clifford, as a symbol of the DC establishment, should not have any influence whatsoever, declaring that "if you ever see us relying on Clark Clifford, you'll know we have failed", yet Carter eventually came to rely on him nonetheless. Clifford was born in Fort Scott, Kansas, the son of Frank Andrew Clifford and Georgia Clifford (née McAdams). He attended college and law school at Washington University in St. Louis, Missouri, and built a solid reputation practicing law in St. Louis between 1928 and 1943. Close associates of President Harry S. Truman, photographed in spring 1948, during the President's vacation at Key West, Florida. Left to right: Clark Clifford (White House Counsel), William D. Hassett (White House Correspondence Secretary), John Steelman (Assistant to the President) and Matthew Connelly (White House Appointments Secretary). In his role as presidential adviser, one of his most significant contributions was his successful advocacy, along with David Niles, of prompt 1948 recognition of the new Jewish state of Israel, over the strong objections of Secretary of State General George Marshall. On January 19, 1968, Johnson announced his selection of Clifford to succeed Robert McNamara as the U.S. Secretary of Defense. Clifford estimated that, in the year just prior to his appointment, he had spent about half of his time advising the President and the other half working for his law firm. Widely known and respected in Washington and knowledgeable on defense matters, Clifford was generally hailed as a worthy successor to McNamara. Many regarded the new secretary as more of a hawk on Vietnam than McNamara, and thought his selection might presage an escalation of the U.S. military effort there. Clifford attempted to allay such fears when, responding to a query about whether he was a hawk (favoring aggressive military action) or a dove (favoring a peaceful resolution to the Vietnam War), he remarked, "I am not conscious of falling under any of those ornithological divisions." Eventually Clifford moved very close, with Johnson's tacit support, to the views McNamara held on Vietnam just before he left office—no further increases in U.S. troop levels, support for the bombing halt, and gradual disengagement from the conflict. By this time Clifford clearly disagreed with Secretary of State Dean Rusk, who believed, according to The Washington Post, "that the war was being won by the allies" and that it "would be won if America had the will to win it." He later recalled how he turned against the war: "I found out that we couldn't win the war with the limitations that we had, which I thought were correct limitations, and I thought all we were going to do was just waste the lives of our men and our treasure out in the jungles of North and South Vietnam." After he left office, Clifford, in the July 1969 issue of Foreign Affairs, made his views very clear: "Nothing we might do could be so beneficial ... as to begin to withdraw our combat troops. Moreover ... we cannot realistically expect to achieve anything more through our military force, and the time has come to begin to disengage. That was my final conclusion as I left the Pentagon ...". Clifford received the Presidential Medal of Freedom, with Distinction, from Johnson on the President's last day in office, January 20, 1969. An audit by Price Waterhouse revealed that contrary to agreements between First American's nominal investors and the Federal Reserve, many of the investors had borrowed heavily from BCCI. Even more seriously, they had pledged their First American stock as collateral. When they missed interest payments, BCCI took control of the shares. It was later estimated that in this manner, BCCI had ended up with 60 percent or more of First American's stock. There had long been suspicions that First American's investors were actually nominees for BCCI. However, the audit was solid confirmation that BCCI secretly—and illegally—owned First American. A "Report to the Committee on Foreign Relations of the United States Senate", prepared by U.S. Senators John Kerry and Hank Brown, noted that a key strategy of "BCCI's successful secret acquisitions of U.S. banks in the face of regulatory suspicion was its aggressive use of a series of prominent Americans", Clifford among them. Clifford, who prided himself on decades of meticulously ethical conduct, summed his predicament up when he sadly told a reporter from The New York Times, "I have a choice of either seeming stupid or venal." Acacia, John. Clark Clifford: The Wise Man of Washington. Lexington, KY: Univ. of Kentucky, 2009. ^ "Clark M. Gifford - Lyndon Johnson Administration". Office of the Secretary of Defense - Historical Office. ^ a b Edwin M. Yoder Jr., "Government tasks will test Trump’s skill"
^ "Historical Office." Clark M. Clifford > Historical Office > Article View. N.p., n.d. Web. 13 Jan. 2017. ^ “Interview with Clark M. Clifford, 1981.” Archived January 14, 2011, at the Wayback Machine May 18, 1981. WGBH Media Library & Archives. Retrieved November 23, 2010. ^ a b c d e "Clark McAdams Clifford". Arlington National Cemetery. ^ a b Peter Truell, Larry Gurwin (1992) False Profits: The Inside Story of BCCI, the World's Most Corrupt Financial Empire. Houghton, Mifflin Company, Boston, New York. ISBN 0-395-62339-1.